I haven’t posted anything to the Black Swan Blog for 8 months. One reason is that I have had a few other projects that have really monopolized my time. But the other reason is that I usually write blog posts in response to something that interests me in the world of renewable energy. Frankly, not much has been happening since last summer. I was pretty certain that Texas would be encountering severe problems because of the fluctuations in their wind energy generation. In fact, they had no problems at all last summer. That was helped by the addition of 1.3 GW (Net of reductions) of Natural Gas plant capacity (according to the December, 2014 Report on the Capacity, Demand, and Reserves) and a maximum peak demand of only 66.5 GW in August 2014 as compared to a peak demand of 67.25 GW in August, 2013 and an all-time peak of 68.3 GW in August, 2011). I did find it interesting to note that ERCOT has now redefined the peak capacity percentages for wind resources. This is essentially the percentage of nameplate wind capacity that can be relied upon during peak demand times. Based upon 6 years worth of data and a large installed generation base this value is 12% for onshore resources in the summer, 19% for the winter. For offshore resources the values are 56% in the summer and 36% for the winter. Unfortunately the vast majority of Texas wind farms are onshore and peak demand is in the summer. Some of my most popular blog posts have been about the experience with renewables in Hawaii and on that topic there have been a number of interesting developments. In many ways, at least with regards to solar energy, Hawaii is on the bleeding edge with regards to dealing with the opportunities and the problems associated with incorporating large amounts of solar energy into their utility grid. The issues I had raised in an earlier post have started to reach a critical stage. The “success” of the rooftop solar program has brought many of the circuits in the state to the point where they are at risk of becoming unstable, possibly leading to failures or equipment damage. As a result new permit requirements have been put in place and in the last quarter of 2014 there was a dramatic drop in the number of rooftop solar installations, continuing a trend that started in January, 2013 (Note: I am not a big supporter of rooftop solar even in Hawaii for a number of technical and social equity reasons that I have discussed previously. The law suit between Solar City and the Salt River will determine whether or not a fixed infrastructure charge for solar panel owners will hold up in court). In another blog post I was very critical of the Hawaiian Electric Company’s approach to renewable energy. It seemed to me that they didn’t have a realistic plan and were basically completely lost with regards to creating a sustainable energy environment. So it was no surprise to me that the company was sold to NextEra in December, 2014. NextEra brings economic clout and a track record of successful renewable projects to the Aloha state utility but will also bring a focus on the “bottom line” that was missing. Meanwhile, Kauai Island Utility Co-op (KIUC) is taking what I believe is a much different and better approach to the development of solar power. A major focus has been on utility-scale solar installations. 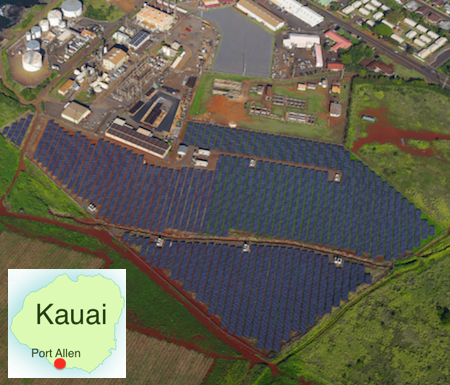 In December, 2012 the largest solar installation in Hawaii came on-line in Port Allen. On a sunny day the 6 MW facility is able to provide almost 10% of Kauai’s daytime energy needs. KIUC recognized that solar power output can vary by as much as 70-80% because of passing clouds. As a result the Port Allen facility was designed to have a large battery backup component that could compensate for short-duration power drops. Through real-world operational experience they found that their initial battery configuration could not stand up to the rapid cycling experienced when trying to stabilize solar power. As a result the utility is replacing the lead-acid batteries in the initial configuration with lithium-ion batteries. KIUC has not been deterred because of the operational problems it has experienced. The utility is taking the sensible position that these kinds of issues can be expected when trying to really push a new technology. They are in the process of commissioning an addition 24 MW of utility-scale solar which will provide up to 80% of Kauai’s daytime electrical needs. And if the new batteries prove to be cost-effective the utility can start to extend the impact of the solar array by releasing stored energy to the grid in the late afternoon and early evening. As far as I am concerned KIUC is on the right track. Now if only they would combine a Concentrated Solar Plant with their PV installations they could provide solar power 24 hours a day as they do at the Gemasolar plant in Spain.